I don’t know anyone who doesn’t have a favorite pair of jeans. You’ve just gotta love denim! It washes well, it’s tough, and comes in a variety of rinses. Since it’s just about spring cleaning time, lots of us are going through closets and drawers and looking for what we need to pitch, donate, etc. Odds are you or your family members have some denim items that are needing to leave! Don’t bag up those old pants yet–I have been looking into and experimenting with ways to upcycle that denim into something fresh and useful (or just cute!). 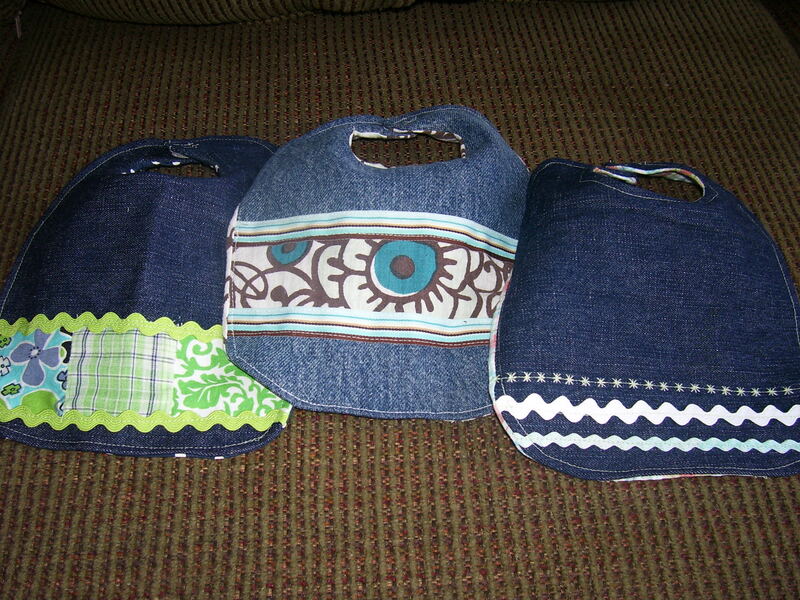 The first denim project I wanted to tackle are denim bibs. Not bib overalls, I’m talking bibs for babies. No, I don’t have any babies left in my house, but I thought these would make nice little shower gifts for boys or girls. One cute bib coming right up! The first thing I did was make a bib template. I actually got this one from the book Sew Darn Cute, but you could easily trace one from an existing bib. I traced it onto my piece of denim and cut it out. I then chose a piece of cotton that I wanted to use for the back. I did NOT trace the template onto the cotton, you’ll see why in a minute! Adding some rickrackpin those pieces right side together! As you can see from my pics, I pinned on some rickrack to add some extra cuteness. You can sew it on at this point, or just pin it with about 1/4-1/2″ extra sticking out at either end. Pin the denim shape and the rectangle of printed cotton right sides together. Now you are ready to sew! 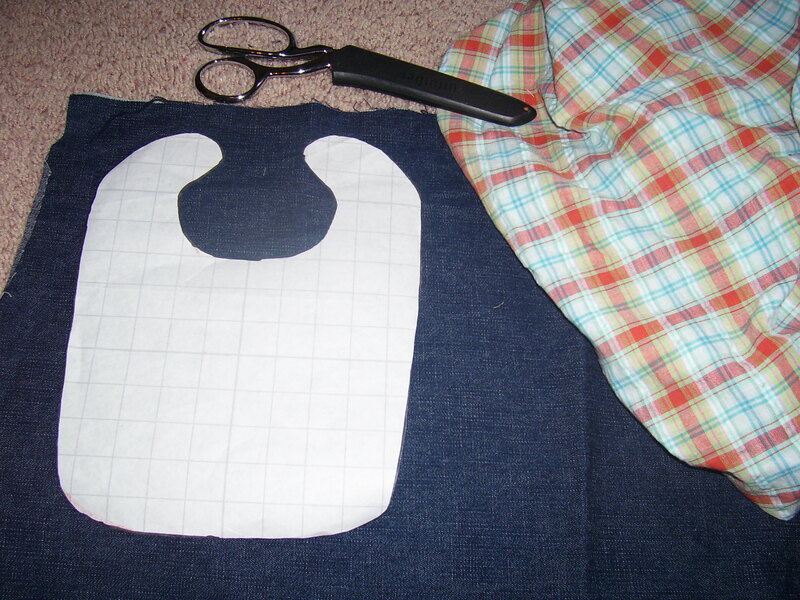 Sew the whole way around the perimeter of the bib shape, leaving about a 2″ space (I did mine at the bottom edge). At this point I cut the printed cotton to the shape of the bib. Then you turn the whole thing right side out. Sew around the outside edges of the whole thing for a more polished look, tucking in the 2″ spot that wasn’t sewn before as you go. Since I hadn’t actually sewn the rickrack across the width of the bib, I did a straight stitch across each length of rickrack. 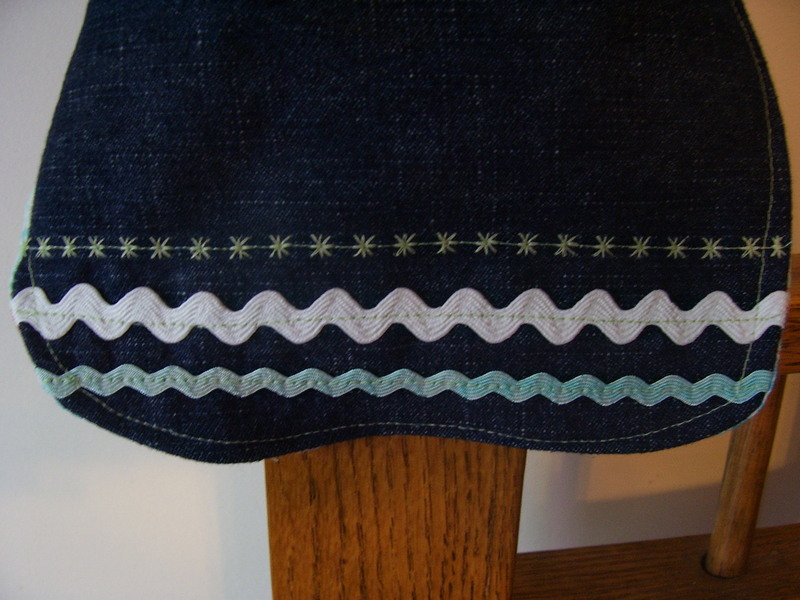 For extra embellishment, I also did a length of decorative stitching. The final step is to make something to actually fasten the bib. I chose adhesive velcro circles which I also stitched on for extra security. Other options may be snaps or ribbon or thin bias tape to tie it on. I was so pleased with how this turned out that I made a couple more. Hey, who doesn’t need a sweet baby gift on hand? This entire project took maybe 15-20 minutes and costs virtually nothing to make since I already had all of my materials on hand. 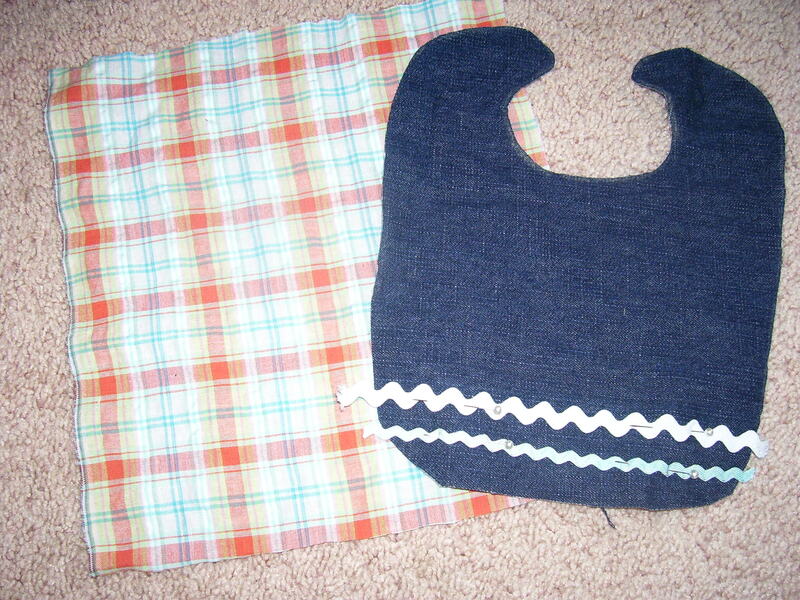 For the other two bibs I simply used scraps of cotton , pieced them onto the front, and covered up the raw edges with either grosgrain ribbon or rickrack. There’s lots of other possibilities you could do with this aswell. Now, go dig out that old denim, get your cretive juices flowing, and have some fun with it!